First, is important to understand the components involved in the configuration and the relationship between them. The resource adapter is the central component for the JBoss EAP configuration. It provides the link from the EAP to the A-MQ broker. In a nutshell, a resource adapter is a deployable Java EE component (usually a .rar file). 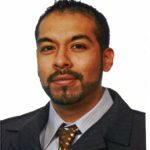 The resource adapter provides communication between a Java EE application (usually deployed on the JBoss EAP instance) and an Enterprise Information System (EIS) using the Java Connector Architecture (JCA) specification. A resource adapter is often provided by EIS vendors to allow easy integration of their products with Java EE applications. On JBoss EAP 7, the resource adapters are defined in the resource-adapter subsystem. 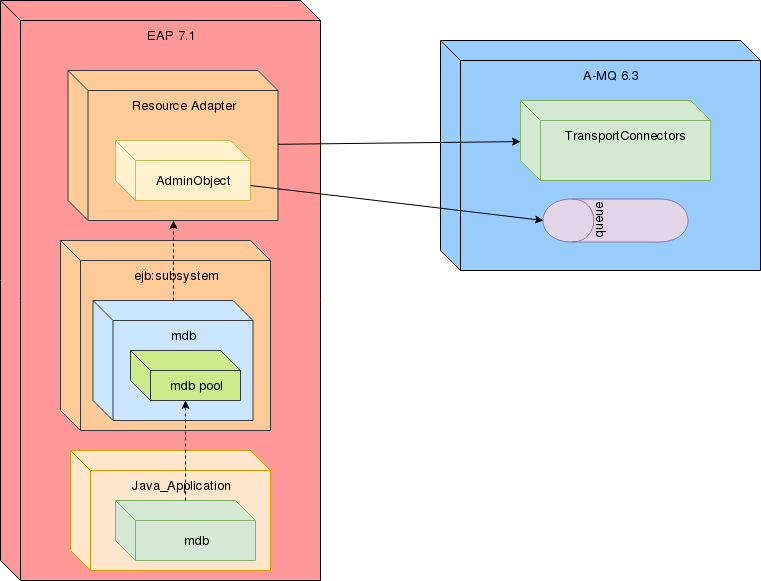 The MDB configuration in JBoss EAP provides the capability to the Java applications to create a consumer of the A-MQ linked to JBoss EAP. In addition, the MDB pool provides a constraint on the number of instances and sessions available. The image below depicts in a simple way how the components described above are related. In JBoss EAP 7.1, the recommended messaging broker is AMQ 7, which has an integrated resource adapter in the messaging subsystem. However, is possible to use a different messaging broker or a legacy A-MQ messaging broker. Extract the resource adapter from the A-MQ 6.3 distribution. The initial step is to extract the .rar file from the A-MQ 6.3 distribution to a more accessible location. The resource adapter zip container is located in $AMQ_HOME/extras/apache-activemq-5.11.0.redhat-[LATEST_VERSION]-bin.zip. Extract the file to a known location: [AMQ_RAR_DIRECTORY]. Deploy the resource adapter in a standalone/domain JBoss server using the CLI. Deploy the resource adapter using the management console. In order to deploy a resource adapter manually to a standalone server, copy the resource adapter archive to the server deployments directory $EAP_HOME/standalone/deployments/. As a result, the scanner will inspect the deployments directory and deploy the resource adapter. Probably, it is a requirement to have different server groups working with different broker technology or configuration. In order to achieve a better separation of concerns regarding access to JMS services, a new profile that contains the broker configuration can be created. First, set up the server URL, the access credentials, and the type of transaction support. A possible connection-definition class-name can be: org.apache.activemq.ra.ActiveMQManagedConnectionFactory. The election depends on the type of factory you have to use. The “XA recovery” is the process that updates or rollback a transaction if one of the participant crash or is unavailable. XA recovery happens without user intervention. Each XA resource needs to have a recovery module associated with its configuration. The admin objects are created in order to provide JNDI lookup of JMS queues for JBoss EAP applications. The attribute that often causes problems to define an unanswered question is the pool-name attribute of the admin-object. The attribute “pool-name is not implemented in JBoss EAP, that means, this attribute should not be used. You can configure resource adapters using the management interfaces. I show below how to configure a resource adapter using the management CLI. If you are using this document as a reference for other resource adapters, it is important to check the vendor’s documentation for supported properties and other important information. Add the server configuration property. Add the port configuration property. Configure a managed connection factory configuration property. In order to correctly define the “recovery-plugin-properties” using the CLI commands, first, add “recovery-plugin-class-name”. Configure an admin object configuration property. First is important to understand what an MDB is. MDBs are a special kind of stateless session beans and they are the JMS consumer of a specific queue. They implement a method called onMessage(Message message) executed when a JMS destination on which the MDB is listening receives a message. The JMS consumer is responsible to trigger a MDBs asynchronously. By default, the MDBs have 16 sessions to process messages concurrently. Add the requisite message-driven bean configuration to the urn:jboss:domain:ejb3 subsystem in the JBoss EAP configuration. First, the A-MQ configuration requires the transport connectors that define the endpoint used by JBoss EAP to integrate the resource adapter. This article provides a detailed description of Red Hat JBoss EAP 7 integration with A-MQ 6.3 and the admin-object configuration, which is a complex process if the required steps are not clear for the integrator. This article covers the admin-object setup and the pool-name attribute in great detail and provides a good hint regarding the correct configuration.